The US state of Arizona has admitted that a drug it uses for executions has been supplied by a UK company. The admission came shortly before Jeffrey Landrigan was put to death after the Supreme Court lifted a federal judge's stay of execution. The delay was based on objections that the drug was not US approved. Arizona had to import the anaesthetic sodium thiopental after US supplies ran out. Concern has been raised in the UK, where there is no death penalty. Arizona said it wanted to show the drug came from a "reputable place", in the first admission by a US state that sodium thiopental supplies come from outside the US. The shortage of supplies in the US had slowed executions since the spring. Arizona's attorney general revealed that the drug had come from England but he did not name the supplier. Writing in the Guardian newspaper, a British civil rights lawyer, Clive Stafford Smith, has called for the naming and shaming of the company as it was "making a business out of killing". Landrigan, who is 50, was sentenced in 1989 for murder. 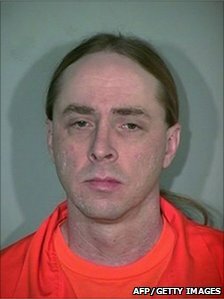 He spent more than two decades on death row. He was due to be executed on Tuesday morning, but the federal judge ordered a delay, calling for the source of the imported drug to be disclosed. Landrigan's lawyers argued that if the drug was obtained abroad it might not meet US drug standards and could fail to work properly. Sodium thiopental is the first in a sequence of three drugs used in lethal injections. So now we produce death chemicals in addition to the electronic batons and other unholy equipment used to torture all sorts of victims al over the world. It's a proud day, eh. A vital piece of the GDP.